USGA and R&A Release New Rules to be Applied on Jan 1st, 2018. A first step in adapting our game to our present day’s reality was taken when the USGA and R&A announced on Monday that a few of the proposed rules will take effect on January 1, 2018. A “working group”, which includes the PGA Tour, European Tour, LPGA and PGA of America, made the decision to assign a rules official to a tournament broadcast to resolve issues. The official video play-back will give a rules official the grounds to make decisions based on what the proper broadcasting video captured. The group also voted to stop considering viewer call-ins when processing potential rules violations. 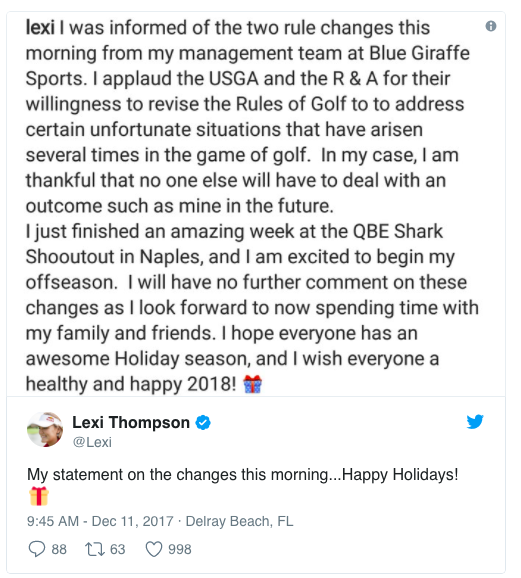 This cost Lexi Thompson four strokes in the final round of the ANA Inspiration after an email was sent in by a viewer after the third round. Two strokes for the penalty and two stroked for signing the incorrect score. The rule for signing an incorrect scorecard was also scrapped as long as the player was unaware of the violation that occurred during the round. These rules are well adapted to present day reality and it’s great to see them applied sooner than expected. The rest of the overhaul will be evaluated next year and implemented on Jan 1, 2019.